Danny is back in this sequel to YA superhero book Dreadnought. Sovereign has it’s own plotline, but it continues the threat of Nemesis and Danny’s character growth. Thus, I’d recommend reading the series in order. Nine months after Danny debuted as Dreadnought and publicly came out as lesbian and transgender, she’s stretched to the breaking point. She’s the only superhero defending New Port, her relationship with Calamity is strained, she’s still trying to get legally emancipated from her parents, and now there’s a new super villain on the loose. Danny won’t be able to fight him on her own. She’ll need to learn how to act as part of a team. I picked up Sovereign when I was looking for something relatively light. Obviously, I forgot the dark undertones of Dreadnought. Sovereign feels even darker than the first book, with Danny now possessing anger issues and PTSD. 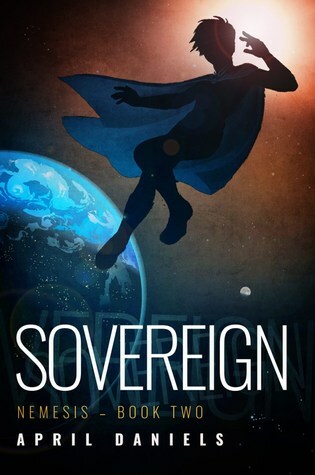 There’s a bit too much substance here for Sovereign to be purely a popcorn book. While this series still works as a fun superhero read, I think it works at another level as well. Sovereign also features the return of one of the most repellent villains I’ve ever read, Graywytch. I guess she’s effective at getting the reader to hate her, but oh my gosh she’s so horrible. She’s basically the lowest sort of internet scum (picture a TERF twitter troll harassing trans women) made into a comic book super villain. She’s probably one of those people who have their chromosomes in their twitter handle. I do have a spoilerly note regarding problematic intersex representation. It’s seriously super spoilerly so read with caution. Graywytch has an evil scheme to kill everyone with a Y chromosome, but she ends up getting affected as well. Danny points out that Graywytch never bothered to have her chromosomes checked, and what’s happening to her is likely because she actually does have a Y chromosome — she’s intersex. On one hand, a TERF villain turning out to have a Y chromosome is wonderfully ironic. On the other hand, it’s pretty horrible representation for intersex people, getting thrown in as a plot twist and psychological punishment for the villain. Okay, end spoilers. My other main criticism would be that Danny and Sarah got together awfully quickly. Maybe this is just me not getting how romantic relationships work… they did know each other for a while before hand. It just seems strange to have it happen so suddenly like that. I’m really growing fond of these characters. I think Doc Impossible is my favorite. She just gives me so many feels! I love Danny having a supportive if troubled parental figure in her life. Additionally, Sovereign also introduces a nonbinary supporting super hero. Basically, this is a pretty good superhero series centered around queer and female characters. I think I liked Sovereign even more than the first book. Nice. I always feel that the first novel of a series is easier to make interesting – you get to introduce the cast, the world, some issues, have the protagonist deal with it, a bit of plot on top, done. But in the second one you need to proof that you can write something interesting when much of that is already old news. So good to know that the sequel hasn’t turned out to be boring. I’d agree with this — sequels always need to add something new, instead of just rehashing the previous book. I’ve just started Sovereign so this review was well-timed! I’m glad to hear you liked it better than the first book, it’s definitely caught my interest already. I went ahead and read your spoiler because I doubt I’ll be able to get to this one any time soon, what with my full reading schedule at the moment. Obviously I haven’t read the book so I can’t comment in depth, but the plot twist as it is presented does sound a bit gimmicky and thus a little insensitive….